Located in 2 cities in USA, New York and San Francisco, SendPulse consists of a small team of 35 people who work around the clock to provide support to their growing base of 250,000 active users. These users include bloggers, business owners, marketers, and large corporations. Continue reading to learn more about the features that set SendPulse apart and why you should start using this tool to grow the subscribers’ base of your blog or business. In this review, we’ll evaluate SendPulse on factors such as pricing, ease of use, features, customer support, and overall sentiment around the product. As is the industry standard, SendPulse offers both list-based and pay-as-you-go plans. It also offers a free plan wherein you can send up to 15,000 emails per month to up to 2500 subscribers. Apart from these plans, there is also a VIP plan if you have more than 1 million subscribers. You’d have to reach out to the sales team to sign up for this plan. The sign up process with SendPulse is incredibly simple, requiring just about your basic contact information. You’ll then be asked to provide a verification code which would be sent to you via email. Once you’ve verified your account, you’ll be taken directly to the user interface. The user interface is easy on the eyes and the navigation is simple, making SendPulse an extremely user-friendly tool. The UI mostly uses blue and green, with other colors added in to draw your attention to the key features and buttons. If this is your first time using an email marketing tool, you’ll be surprised at the ease at which you’ll be able to create your first email campaign. The dashboard displays the number of subscribers you have, the number of emails sent (if you’ve already used SendPulse for your email campaigns before). Below that you’ll see a brief report on your previous campaigns (emails delivered, clicks, errors, etc.). The whole layout is designed to offer you quick access to the features and information you’ll be using the most. You can start building your email list by clicking on “new mailing list” and entering email ids manually or importing them through a .txt or .csv file. You can also import your email list directly from a preexisting email contact list as you can see from the screenshot below. I found this feature to be the most useful as it is hassle-free and saves a lot of time, especially if you’re migrating from other ESPs such as Mailchimp or GetResponse and have an email list of 1000+ subscribers. Once you’ve imported your email list, you can move on to creating your first campaign. You can begin by simply selecting your email list, “from” email address, sender’s name, and subject line. Next, you’ll have to choose a template for your email. 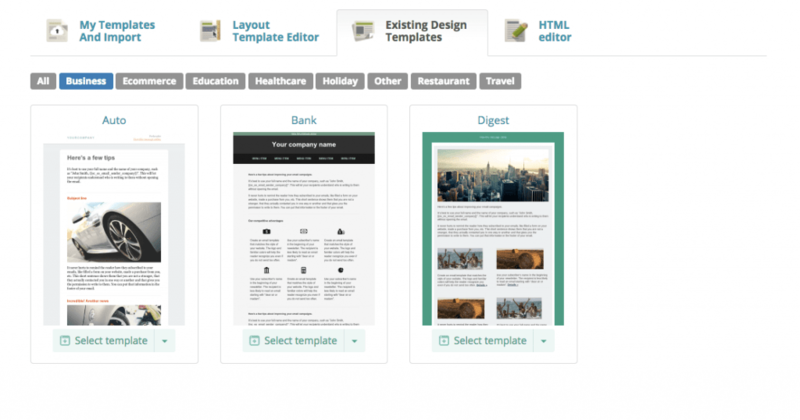 You can either choose existing SendPulse design templates as shown below or select one of four options (basic, news, commerce, text) from the layout template editor. Once you’ve selected the template, you’ll be taken to a page where you can customize the content of your email before sending it out to your subscribers. 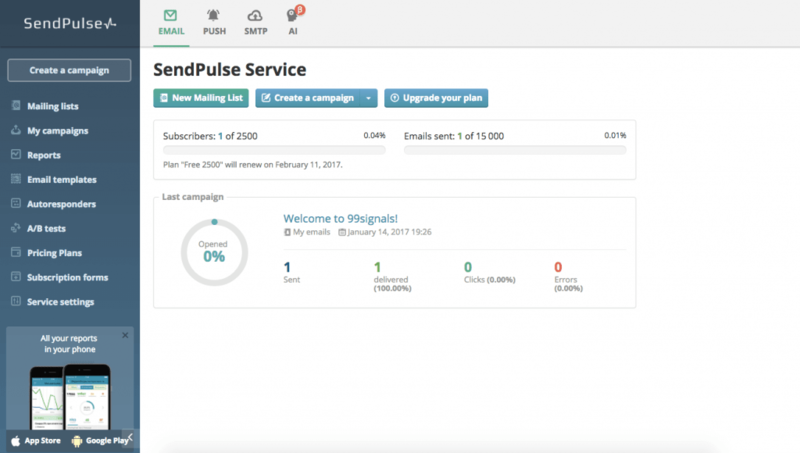 SendPulse offers all the features a reliable email marketing software should do and then some more. While I was impressed with all the basic features such as predesigned email templates, subscription forms, list segmentation, and so on, I was surprised to discover a few features that are either unique to SendPulse or provided only under paid plans of other ESPs. Autoresponders – Autoresponders aka automated emails are essential to growing your email list. As such, providing this feature is a must for all email marketing services. The most amazing aspect of SendPulse is that the tool allows you to leverage the power of autoresponders even under their free plan. I haven’t come across any other service which provides this all-important feature for free. So if you’ve just started your blogging journey and want to see the true potential of automated emails, you should probably opt for SendPulse’s free plan. Subscription Forms – Subscription forms provided by SendPulse are nothing fancy, but they do the job. You can create a professionally-designed subscription form through their easy-to-use drag and drop feature. You can then integrate this subscription form to your website and start building your email list. List Segmentation – You can segment your mailing list based on criteria which include: date of addition, active subscribers, new subscribers, domain part, rating, etc. A/B Testing – A/B testing or split testing allows you to measure the effectiveness of your emails and improve your results based on your subscribers’ preferences. This is a paid feature with most ESPs, but SendPulse offers this feature even with the free plan. Push Notifications – This is just an awesome feature provided by SendPulse, wherein you can enable push notifications for your website. This will allow users to get notifications on their desktop whenever you update content on your website. This feature can be enabled even with the free plan, but your push notification box will have a “Powered by SendPulse” label. Nonetheless, it’s an extremely useful feature, especially for professional bloggers. Resend to Unopened – This is yet another feature which impressed me. As the name suggests, this feature allows you to send emails to people within your email list who haven’t yet opened your emails. Depending on your industry, this feature can easily result in increase in the open rate by 30-80%. This feature is usually offered as part of the paid plans by most ESPs, but even users under free plan can leverage this uber-cool feature. 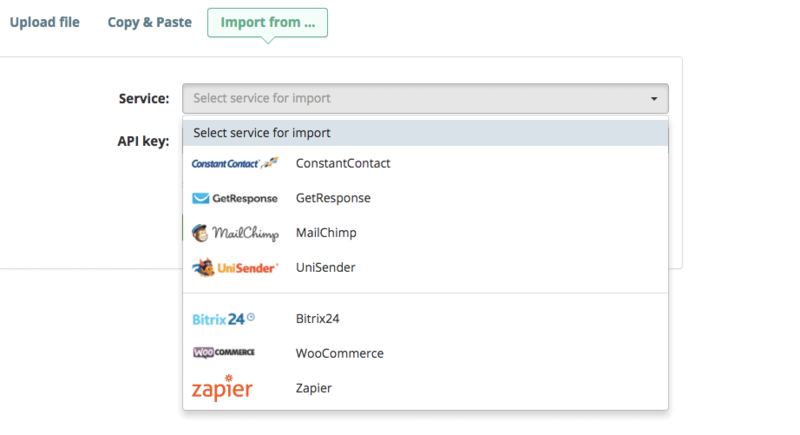 Integrations – SendPulse is integrated with 500+ services which include Zapier, WordPress, WooCommerce, Typeform, etc. Analytics and Reporting – Analytics is an integral part of what makes email marketing so effective. SendPulse offers analytics reports which show the following stats. These stats can also be viewed on the SendPulse mobile app. Customer support can make or break an ESP’s reputation. It’s an aspect of business that simply can’t be ignored by companies which want to excel in every department they are serving their customers in. SendPulse provides 24 hour phone and chat support to walk you through any questions or issues that you may have with the product. The team is even open to understanding what additional improvements or suggestions you can provide to make their product better. This is an area where SendPulse definitely excels over some of their competitors. Few ESPs provide live chat and phone support. Mailchimp, for instance, doesn’t provide phone or chat support and only provides email support if your question is not featured in their FAQs or resources section. A Knowledge Base page, featuring basic information concerning all the features that SendPulse offers with their email service. An FAQ page on SendPulse services. You can get most of your questions answered here. SendPulse is also active on Facebook and Twitter. You can get alerted on new features or get your questions answered by tuning into their social media pages. Since SendPulse is a new entrant in the ESP market, it doesn’t have as many reviews as some of the other players in the industry such as Mailchimp and AWeber. Nevertheless, the existing reviews on review sites such as G2Crowd are overwhelmingly positive. SendPulse manages to be an excellent email marketing tool, offering all the basic features an ESP should do while providing a few unique ones which really set it apart. The email service would be a good fit for both small and medium-sized businesses looking for a cost-effective, yet reliable ESP. It will also help bloggers who are at the start of their journey who don’t have the budget to spend on premium features such as autoresponders and push notifications. The interface is simple and first-time users will find it extremely user-friendly. If you want to learn the basics of email marketing, then SendPulse is the ESP you should probably go for. Secondly, features such as autoresponders, push notifications, and the ability to send to unopened are included in the free plan. Autoresponder, in particular, is a fundamental aspect of email marketing that helps you build a loyal subscriber base. The fact that it’s included in the free plan allows you to use this powerful feature and witness first hand what it can do to your email list. Thirdly, it’s way more economical than Mailchimp or for that matter, any other ESP in the market. Even when you upgrade to one of the paid plans, you will be paying less than what you’d normally pay once you sign up for Mailchimp’s paid plans. Give SendPulse a try and let me know what you think. With a free plan that gives you access to unique features and an easy learning curve, it’s hard not to be impressed by SendPulse. Sandeep, thank you for this thorough outline of Sendpulse. In particular, the comparison w/MC. I am a MC user, and was literally looking for a reason to CANCEL my Sendpulse subscription (Im an appsumo jukie and bought their ‘deal’)…but your writeup convinced me to bite the bullet and migrate to Sendpulse. thanks. Hi Nico – I’m an AppSumo junkie too! 😀 Glad you found the review useful. I like both SendPulse and MailChimp. But since SendPulse provides free automation features and web push, it has a slight edge over MC. Having said that, they do need to work on their integrations! Sendplus is the most optimal newsletter distribution system for https://www.hecmo.com/. It’s easy to operate and it’s constantly updated, effortlessly improving your productivity and performance. We choose to use Sendplus because of the great balance of features and the reasonable pricing. Also, we are very satisfied with the response from the support team – it seems that the company has the same values as us, and puts the customer above all else.